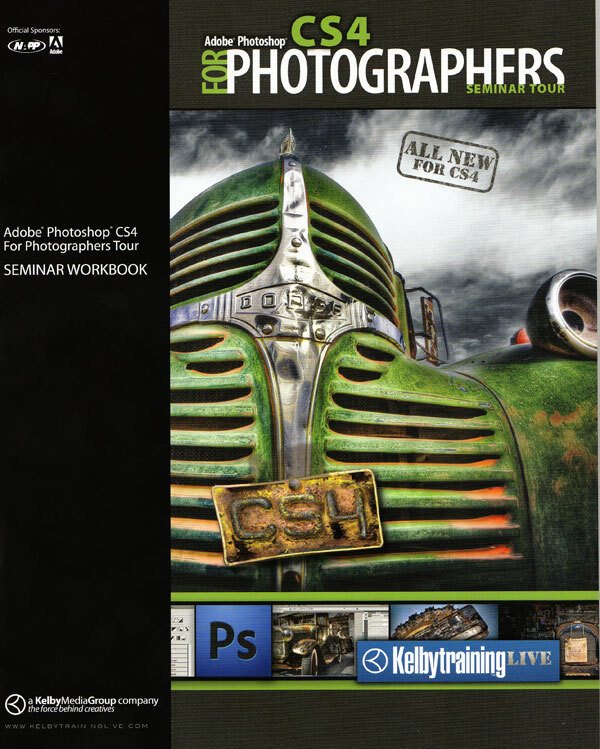 Kelby Training live came to San Diego today with the Adobe Photoshop CS4 for Photographers seminar. This is one of the Photoshop training seminars taught by Ben Willmore, an amazingly talented photographer and photoshop instructor. I did not get the chance to take any of the classes taught by Ben during Photoshop World so I was looking forward to this 1-day seminar. My day started with the craziness that is downtown San Diego. I parked at the South end of the convention center and then had to walk nearly the length of the building to get in, only to have to walk nearly all the way back on the 2nd floor to get to the seminar location. This was mildly annoying, but as I was soon distracted by NIK software, WACOM tablets, Graphics Authority and the NAAP bookstore. I made my way over to the registration table and since I had not pre registered, I needed to fill out the registration form and pay for the class. As a NAPP member I saved $20 off the class and what would have been $99 was only $79. Great deal and one of the great membership benefits of NAPP. For my fee, I received a great workbook, a keyboard shortcut booklet, and a Kelby Training Goodies Disc. I went into the seminar and took a seat in the back row where I would be able to plug my laptop in if needed. The room was about half full when I sat down and quickly filled up. I don’t think there was an empty seat at 10am when the seminar started. I ended up sitting next to a guy who worked for a golf manufacturer and in the product development they use photography and photoshop. Sounded really interesting and something I never would have thought of. And know the question that everybody who was at Photoshop World want’s the answer to: I am sorry to say that Ben Willmore is growing his hair out and the mohawk is a thing of the past, or at least until next years burning man. The first two sections were real eye openers for me. The idea that I should be thinking about what I wanted to do in Photoshop before I even take a photograph. This is very different from the way I think and shoot now. I have also not been a great fan of HDR photography, but I have to tell you, seeing the images that Ben has created is a real eye opener. He really knows how to push the envelope and still create images that are stunning. The second part of the day was working in Photoshop, from the basic tools to the new and improved adjustment palette to the best way to use the healing brush, the clone tool and Adobe Camera Raw. Now, I am not going to tell you all the stuff that Ben went over, cause I think that Kelby Training would not appreciate that at all. One of the most interesting parts of the day for me was to see how Ben approaches an image and what he does to make it his own. Seeing the RAW starting point and then all the adjustments, masks, tweaks, and other changes that go into creating one of Ben’s art prints. A really great class and I even have a better understanding and appreciation of HDR photography. A quick note on the Kelby Training Goodies DVD. This thing is packed with … well.. goodies. From Photoshop brush sets to training videos and 30 day software trials, this disc is a great resource and shouldn’t be overlooked. I went to that seminar back in Feb. It was absolutely amazing! I have been to your site several times now, and this time I am adding it to my bookmarks 🙂 Your discussions are always relevant, unlike the same-old stuff on other sites (which are coming off my bookmarks!) Two thumbs up!